The Israeli government has seized on Hamas’s failure to immediately observe a cease-fire about which it was never consulted as the pretext for escalating its one-sided war against the nearly two million Palestinians confined to the narrow and densely populated Gaza Strip. Fresh Israeli air strikes Tuesday sent the Palestinian death toll in Gaza climbing to the 200 mark, with another 1,400 or more wounded. Meanwhile, the crude and mostly homemade rockets fired from Gaza in response claimed their first victim on Tuesday. A civilian was mortally wounded by shrapnel while bringing candy to Israeli troops massed at the Erez crossing between Israel and the northern end of the Gaza Strip in preparation for a possible ground invasion. Tuesday’s deaths raised Palestinian casualties in the current Israeli onslaught higher than those recorded in the 2012 war against Gaza, which stopped short of a ground invasion. This makes it the bloodiest attack on the territory since the Zionist regime launched its Operation Cast Lead, which sent troops and tanks into the crowded territory, leaving nearly 1,500 Palestinians dead. According to figures recorded by the United Nations, nearly 80 percent of those killed in the current operation have been civilians, including dozens of children. The casualties Tuesday included an elderly Palestinian killed in an air strike on agricultural land in the southern area of Khan Younis and a 25-year-old who died in a drone strike in the al-Zaytoun neighborhood of eastern Gaza City. In a separate air strike on the Jabaliya refugee camp, ten people, including three children and two women, were wounded. Tuesday’s so-called cease-fire was unilaterally decreed by the US-backed Egyptian regime of military strongman Abdel-Fatteh El-Sisi following talks with the government of Prime Minister Benjamin Netanyahu. There were no consultations whatsoever with Hamas, whose leaders said they first learned about it from media reports. The “cease-fire” appears to have been deliberately designed to ensure Hamas’s rejection and provide Israel with a pretext for escalating its assault. General Sisi last year overthrew the Muslim Brotherhood government of President Mohamed Mursi and organized the massacre of thousands of Brotherhood supporters. He also jailed Mursi, along with tens of thousands of others. His regime is now providing tactical support to Israel in the hopes that it will exterminate Hamas, an offshoot of the Brotherhood, and thousands of Palestinian civilians along with it. The cease-fire proposal was striking in that it included no references whatsoever to the demands made by Hamas, which included the release of hundreds of Palestinians taken prisoner in last month’s Israeli crackdown on the West Bank, an end to the seven-year blockade of the territory and reopening of border crossings sealed by Israel and Egypt, and Israel’s respect for a cease-fire agreement brokered by the Mursi government after the Israeli war on Gaza in 2012. In statements Tuesday, Netanyahu indicated that the Egyptian agreement would also include the “disarmament” of Gaza. Palestinian Authority President Mahmoud Abbas played his usual role as a subordinate of Washington and Tel Aviv, calling for unconditional acceptance of the Egyptian proposal. He is to meet with Egyptian officials in Cairo Wednesday. In a statement broadcast Tuesday night, Netanyahu made clear what the Egyptian proposal was intended for all along. “It would have been preferable to have solved this diplomatically, and this is what we tried to do when we accepted the Egyptian proposal for a cease-fire, but Hamas leaves us no choice but to expand and intensify the campaign against it,” he said. First and foremost of these “responsible” nations, of course, is the United States, with the Obama administration signaling the continuation of its unqualified support for Israel in a war in which Palestinian deaths outnumber Israeli by 200 to 1. Washington responded as expected. Secretary of State John Kerry reserved his condemnation for Hamas, blaming it for continuing to fire rockets “at the time Israel and Egypt are working in good faith to get a cease-fire.” He predicted “an even greater escalation of violence,” insisting that “Israel has the right to defend itself.” A planned trip by Kerry to Cairo to promote the cease-fire was called off as the US cleared the decks for an Israeli escalation. 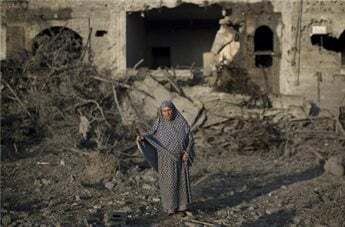 The UN aid agency for Palestinians, UNRWRA, described the death and destruction wrought thus far by the Israeli blitz as “immense.” The destruction includes attacks on Gaza’s water and sewage systems, threatening the health of the entire population. “The level of human losses and destruction is really immense,” said UNWRA spokesman Sami Mshasha. The agency said that over 560 houses had been totally demolished, with thousands of other buildings seriously damaged. These included 47 UNRWA facilities that are housing some 17,000 people who have been forced from their homes by Israeli attacks and threats. This number is set to rise sharply as the Israeli military late Tuesday night issued warnings to some 100,000 people in two northern Gazan areas to leave their homes or face deadly attacks. The warnings are either a criminal form of psychological warfare or the preparations for a ground offensive.